What is the Warranty on your convertible top? 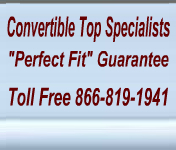 Our convertible tops have a 6 year warranty on fabric and workmanship. This exceeds most original manufactured convertible tops that usually only have a 3 year warranty. Vinyl windows do not have a warranty – that is standard in the industry. How hard are convertible tops to install? We always recommend professional installation. Most of our customers are purchasing their own convertible top and taking it to a local upholstery shop or trim shop for installation. Our convertible tops do not come with installation instructions. Please check your service manuals for installation instructions. We do have General Installation Instructions but they are not for specific vehicles. The instructions will give you a good idea what is involved. Do your tops or windows require any sewing before installation? Our tops are ready for installation; no sewing or cutting is required. How long will it take to receive my top? Convertible tops are considered custom orders and usually take 5-8 working days before shipping. We use UPS and USPS as our delivery partner. As above if you purchase the “window only” you will get a window section with a new curtain and window in the middle. You will not get any product to use on your top section. The rear window assembly consists of the plastic or glass window and all the fabric surrounding it. This assembly fastens to the convertible bows under the top assembly. The rear window assembly is usually the first part re-installed. What if I have a one piece top and the plastic window is bad? It would be best to change your whole top. The cost of removing and sewing in a new window and reinstalling the top would cost the same as replacing the old top. What if the glass window is broken or separating from the top? You need to replace your old top with a new one. Glass windows are bonded or heat sealed into the surrounding vinyl. Can I use my existing top with a new window? In most cases the top needs to be removed to insert the new window section. You can only do this if your vehicle has a two-piece top. Sometimes it is less expensive just to replace both pieces. Can I use my existing window with a new top? If your top assembly is a two piece top and the window is not separating from the material around it you could use your existing window with a new top. In fact there are some cars that you actually need to reuse the glass. The Mazda RX-7 is one of these. If the window is separating from the material around it then you need to buy a new window section. How do I know if my rear window assembly needs replacing? You need a new rear window assembly if your plastic window is cloudy and brown or if your convertible top glass is pulling loose from the surrounding vinyl or cloth. If the fabric is worn, torn or faded you need a new window assembly. If you are changing the color of fabric type you need a new rear window assembly. Can I replace my glass window with a plastic window? Yes, in some cases. If a plastic window option is available for your vehicle it will be listed. The same convertible top pattern is used in both. Can I replace my original canvas top with any other canvas product? This is very common in our industry. All of the canvas materials we use are of the highest quality and you could replace one product with any of the others without a problem. Can I replace my vinyl top with a canvas top? Yes, it is a matter of preference. Cost is a factor in replacement. The vinyl is less. Do canvas tops last longer than the vinyl tops? No, they will wear at the same rate. The manufacturer’s warranty is five years regardless of fabric choice. Should I get a glass or plastic rear window? You can choose in most cases. If you are concerned with originality then you should select the appropriate top. If cost is a factor the plastic windows are less expensive and also cost less to ship. Glass is considered maintenance free and should last as long as your top. Plastic will deteriorate and how long it will last is dependent on many factors such as where it is stored, how much sun it is in, weather, whether you use a protectant, etc. How do I know if I need tension cables or pads? Most domestic tops use side tension cables. Cables support the side and sometimes rear of a soft top. They provide the necessary tension. They run from front to back inside the top assembly and keep the assembly raising and lowering smoothly. They also keep the convertible top looking nice and tight. Pads go from front to back between the frame and the convertible top preventing wear from abrasion. They also help keep the bows spaced evenly. What is the difference between side cables and rear cables? Side cables are threaded through the side seams and they provide tension to the side of the top. Some specific cars use a different kind of tensioning cable and those cables run along the rear belt line. These cables are more problematic and should be replaced with a new top. No, generally speaking they are vehicle specific. How often should I replace my cables? We always recommend replacing cables each time the convertible top is changed. Old cables can get stretched beyond their original length and they become brittle and can break. If this occurs it requires that the entire top be removed and the new cables threaded through. Pads run from the front to the back and protect the top from rubbing against the metal frame when it is raised or lowered. They act as a buffer to keep the bows from wearing out the convertible top fabric. Pads can be reused unless they have been damaged. Do all cars require pads? Most domestic cars use pads. Some foreign cars do not required pads. We list a pad option if it is available for each vehicle. The headliner is a cover that is inside the convertible top and attached to the top frame from the inside. The purpose of a headliner is to hide the convertible top frame and make the car look finished on the inside. What is a boot cover? The boot cover or top cover is used when the top is folded down. It is installed over the top when it is in the well area - it gives the vehicle a nice clean look when the top is down. How do I care for my vinyl window? Do not use everyday products – only ones designed especially for vinyl windows. We recommend the Novus Plastic Polish and Cleaners. You will find them in our Convertible Top Care section. The Novus Polish #1 will protect your vinyl window from the elements that do the most damage and definitely extend the life of the vinyl window. The Novus #2 and #3 can be used on scratches and will remove yellowing that occurs. How do I care for my new convertible top fabric? The best time to start a good maintenance program is with a brand new convertible top. The top fabrics are manufactured with a little protection but if you want to enjoy the new top for the longest time possible then you should begin a good program of maintenance. The only protectant endorsed by Haartz – the manufacturer of your convertible top fabric – is RaggTopp Protectant and Cleaner. There is a product for vinyl convertible tops and one for canvas convertible tops. You will find these products available in our Convertible Top Care section. Whatever your fabric and whatever your problem we have a solution.